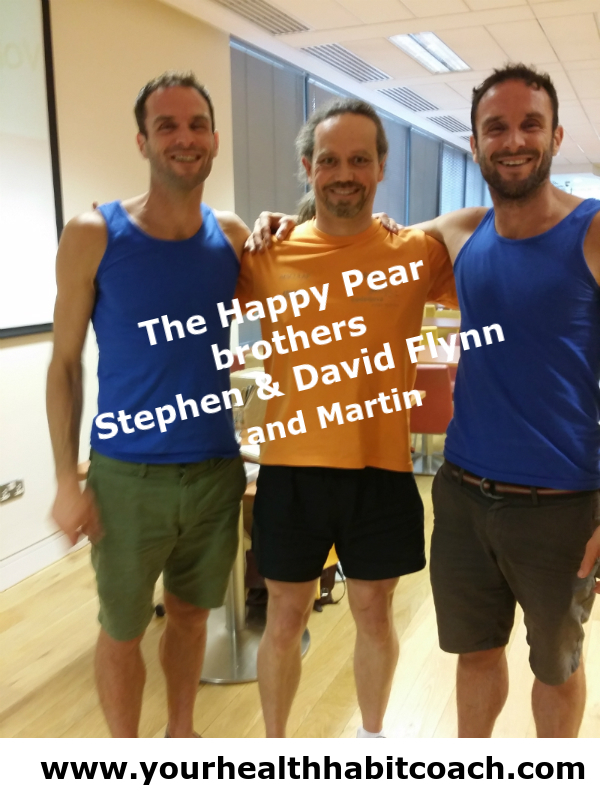 I just met two of the most inspirational, enthusiastic and entertaining guys in the nutrition, health and food field in Ireland, Stephen & David Flynn from the “Happy Pear”. It’s a shame I made it only to the last 30min of their “Nutrition Masterclass” in Ulster Bank’s office building in Leopardstown, Central Park, Dublin 18, where I manage Ulster Bank’s gym, give classes, do my bit to get the bankers fitter, happier and healthier, and raise health awareness. One of Stephen and David’s main message or as they call it “our three-word-manifesto” is EAT MORE VEG !!! (and with veg they really mean (1) fruit, (2) veg, (3) beans, (4) legumes and (5) whole grains). It’s all about, making small, simple, easy to do changes that add up over time and lead to a healthier, fitter and happier YOU !!! One of them, “who is Stephen and who is David ??? ?”, they really look alike. said focus on establishing habits and that’s what I’m all about here at “Your Health Habit Coach”. (4) Wake up early, (85 times) to work on your “First things first” (reference from Stephen Covey, “The Seven Habits of Highly Effective People” and similar books and approaches, re productivity, efficiency and effectiveness, e.g. the 80/20 rule or Pareto-Law etc.. Sorry, I drifted off a bit here, got too enthusiastic. A big THANK YOU to Stephen and David Flynn for coming in to Ulster Bank in Leopardstown, Central park, Dublin 18 and raising awareness, educating folks in a very entertaining and enthusiastic way. Plus a even bigger Thank you for Camilla Waters who organized the Health & Well-Being Forthright in Ulster Bank in Central Park and Georges Quay. Remember to take on Stephen and David’s four day challenge … Going for the Healthier Option !!!! This entry was posted in Food, Health Coaching, Nutrition and tagged Central Park, Health Coaching, in Dublin 18, in South Dublin, in Ulster Bank, Leopardstown, Martin Luschin, Nutrition Coaching, Sandyford, Stephen & David Flynn, The Happy Pear on September 19, 2016 by admini.